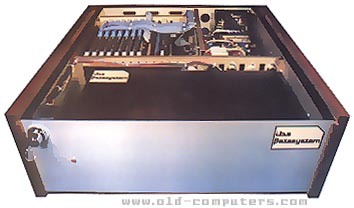 The BetaSystem was a S-100 BUS based system using a complete computer Z80 card that could handle two time-shared users. Up to nine cards could be installed in the case allowing up to 18 users / video terminals to be connected and used simultaneously. As usual with S-100 based systems, a large range of storage devices could be added to the system: 5.25", 8" or 14" Winchester disk drives from 5 MB to 600 MB, 5.25" or 8" floppies, and tape cartridges up to 100 MB. Mainly based on the UCSD PASCAL operating system, the BetaSystem could also be used with CP/M and TurboDos O.S. see more Independant Business Systems BetaSystem Ebay auctions !